One of our lunchtime activities at Cub Scout day camp this summer was learning how to build an edible campfire. 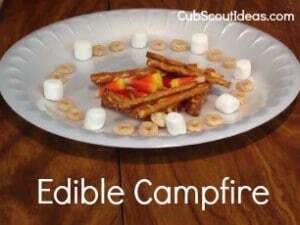 We were able to teach campfire safety via this craft edible campfire. I estimated the amounts of each of the supplies, so I hope this helps you as you’re planning. Create a fire ring with mini marshmallows and Cheerios. Break your pretzel log into 3 pieces and use them to make a “V” or “A” shape. Light the tinder with some red hots sparks. Add the candy corn flames. And there you have it! An edible campfire! cute. unfortunately, the title misrepresents the “lesson” (?) Where is the lesson to a cub scout that has not built a fire and where is the safety in the video? Obviously a cub scout isn’t going to eat the fire. However, 4 minutes of cute is a waste of time. Thank you for your comment! The intention is that a leader will talk the boys through the steps in building a fire correctly – such as having a fire ring, having a shovel or rake handy to raking the hot coals, having water handy to douse the fire, etc. I have had other leaders who have effectively used this as a teaching tool. I think this is a very clever and creative idea. Would love to see this at one of our meetings. Thanks for sharing! Perfect! We’re learning about fire safety. Thank you for posting. So glad it was helpful! Thanks for reading!